NOTE: Date must be in the form YYYY-MM-DD, like 2018-04-14. She was the proprietor of Jeri's Beauty Salon and lead beautician in Zephyrhills, FL, proud and loving mom of four sons & seven grandchildren. She was a native of Hazard, KY, and a resident of Adair County, KY, at the time of her death. Click on headline for complete obituary. Patsy Ann Leslie age 68 years of Columbia, KY passed away Thursday, April 12, 2018 at 11:47amCT at TJ Samson Community, Hospital in Glasgow, KY.
Funeral service will be at 2pmCT, Tuesday, April 17, 2018 at Stotts-Phelps-McQueary Funeral Home, 210 Greensburg Street, Columbia, KY. Interment in Haven Hill Cemetery, 210 Greensburg Street, Columbia, KY. Visitation will be after 10amCT, Tuesday, at the funeral home. 2018-04-14 - Columbia, KY - Photo from family collection. 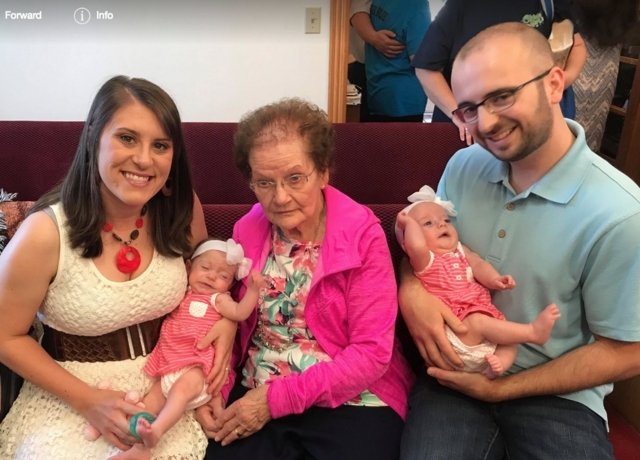 These little girls made big news when they came into this world and now they've just celebrated their first year surrounded by the love of five generations of family. From left are Mom Lauren holding baby Emma Kate, Great Grandma Wanda Cave, and the twin's Dad Cody holding Ellie Beth. Volunteers agree to have their heads shaved in empathy for those undergoing cancer treatments and seek sponsors to raise funds. Stan McKinney, CU associate professor of journalism, has participated for the last nine years. He said he shaves his head to honor two cousins who died as children from cancer as well as his mother-in-law, his mother and best friend from high school who lost their battles with the disease. CAMPBELLSVILLE, KY - Campbellsville University is hosting St. Baldrick's once again to raise money to fight childhood cancer. The event is Saturday, April 28, 2018 from 9am-1pmCT/10am-2pmET on Stapp Lawn, Hoskins Street, Campbellsville, KY. He was a member of Columbia United Methodist Church and retired from KY Department of Transportation and Columbia Medical Equipment. He was patriarch of a highy regarded family. He was the son of the late Tommie And Gladys Cole Conover. He leaves six direct and two step- living descendants. William M. "Billy" Conover, 88, of Columbia, KY, died Friday, April 13, 2018 at 9:15pmET, at Hardin Memorial Hospital in Elizabethtown, KY.
Funeral service will be Tuesday, April 17, 2018 at 1pmCT, at Grissom-Martin Funeral Home, 200 Campbellsvile Street, with Dr. John Hatton officiating. Burial will be in Columbia Cemetery, 315 Campbellsville Street, Columbia, KY. Visitation after 10amCT, Tuesday, at the funeral home. Farmers Market and Hungry Kids Cafe off to a good start on its first day. The crowd was building in the balmy, sunny morning hours, then winds brought the weather change and when rain and thunder rolled in the Market closed to keep everyone safe. Click on headline for full story with photos. The Farmers Market on the Square (FM2) opened the 2018 season Saturday morning, April 14, at 8amCT with 12 vendors. There were lots of bedding plants, green onions and fresh lettuce. Each week more fresh vegetables and fruits will be appearing. There was also a variety of crafts as well as local honey, so for opening day, I was pleased. The crowd was picking up and lots of familiar faces were there until the weather changed. The Adair County 4-H Shooting Sports Open Range day, scheduled for 2pm-4pmCT, Sat 14 Apr 2018, a the Adair County Sportsmen's Club, 100 Sportsmen's Club Road, Columbia, KY is being postponed and will be re-scheduled for a new date to be announced later. - Tony Rose, Adair County Extension Age t for Youth and 4-H.
COLUMBIA, KY (Sat 14 Apr 2018) - The Lindsey Wilson baseball team picked up two wins on senior day after defeating Kentucky Christian 32-0 in game one and 11-4 in game two. Ricky Winfield and Brandon Wilson both picked up win on the mound for the Blue Raiders. All money raised at the breakfast will help support trip to Georgia by history making Campbellsville Middle School Beta Club. CMS teachers Robbilyn Speer and Katie Campbell and Campbellsville Elementary School teacher Farrah Hord are co-sponsors. Campbellsville Middle School Beta Club will host a country ham breakast fundraiser to raise money to attend national convention, 4am-11amCT/5am-12pmNoonET, Saturday, April 14, in the Campbellsville High School cafeteria, 230 W. Main Street, Campbellsville, KY. Tickets are $8 adults/$6 10 and younger. He was a U. S. World War II Army Air Force Veteran and a manager for the Marrowbone Water District. He was born in Ventura County, CA, and was a resident of Burkesville, KY at the time of his death in Barren County, KY. He was the son of the late Marion Waldo, Sr. and Anna Pearl (Tinkle) Wilson, and the widower of Pat Wilson, his wife of nearly 66 years. He was the patriarch of a large, respected family, leaving 39 direct living descendants. Mr. Junior Wilson, 89, a longtime resident of Burkesville, passed away on Thursday, April 12, 2018 at N.H.C. HealthCare Center in Glasgow, KY. The funeral service will be conducted on Sunday, April 15, 2018 at 1pmCT, in the Memory Chapel of Norris-New Funeral Home, 601 N Main Street, Burkesville, KY, with Bro. Gary Cash officiating. Burial will be in the Dutch Creek Cemetery in Cumberland County, Kentucky. The family will receive friends after 2pmCT, Saturday, April 14, 2018 until the funeral hour on Sunday. Chad Parnell reports that the Jones Chapel UMC benefit auction for Bro. Mike Moon, recovering from surgery for pancreatic cancer, is getting overwhelming support even before the event, Saturday, April 14, 2018. Over 100 items will be up for bid. The benefit begins at 5pmCT at The Clubhouse Grill, 647 Gradyville Club Road, Columbia, KY with auction services provided by Dale Hayes of Bryant Realty. Examples of donated items include a Red Geranium Wreath, made and donated by Linda Bennett; a full/queen quilt, made and donated by Margie Coffey; and a car polisher and wax donated by A-1 Auto. Food will be served at the event. For opportunities to bid if you cannot attend the auction, or to donate an auction item, please contact Terry Partin at 270-378-1301 or Chad Parnell at 270-634-3220. --Robert Stone, Saturday, 14 April 2018.